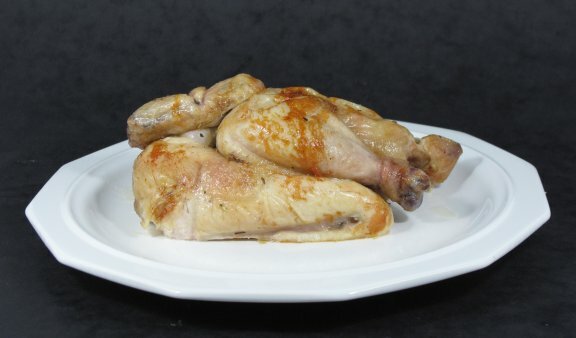 Jamie Purviance, author of Weber’s Time to Grill: Easy or Adventurous, It’s Your Call (review) sent out one of his recipes in his weekly email which was Rosemary-Brined Rotisserie Chicken. I decided to try this yesterday since the weather was so nice in England, and I like chicken. So I popped into the local Sainsbury’s and bought a Taste the Difference Woodland Trust Free Range chicken. If you are going to spend lots of time making something nice then start with great ingredients. OK I have the chicken. I have the brine ingredients but the recipe says the chicken goes into the brine mixture and then into your refrigerator. My guess is that Jamie has an American fridge the size of my entire kitchen; he does not have an issue. Hmmm I have two problems. I don’t have a pot big enough for the chicken and the brine and if I did it would not fit into my fridge unless I took all the shelves out and food. 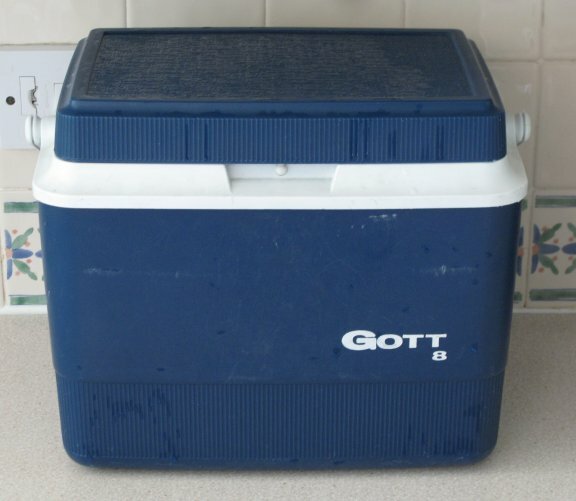 But I do have a beer cooler that fits a 12 pack and some ice so badah bing we are ready to brine that puppy. 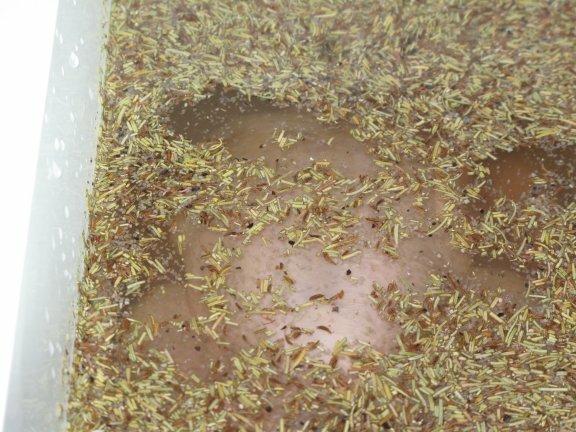 I mixed the brine in the cooler, but changed the recipe a bit to include ½ smoked sea salt and ½ regular. I thought I should taste the brine to see what it was like – BIG BIG mistake, yuck. 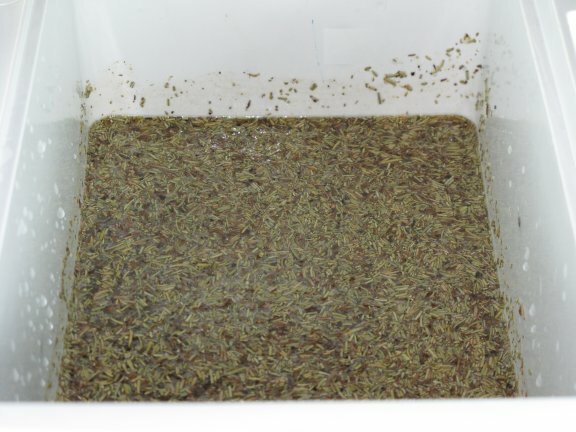 I put about ¼ bag of ice into the brine and on with the lid for 6 hours. After the brine was completed I removed the chicken and patted down with paper towels. Do not wash the chicken because you will rinse the brine out of the skin and meat, which you just spent 6 hours infusing. I then followed Weber’s Time to Grill: Easy or Adventurous, It’s Your Call in the section “Prep School” that shows how to truss a chicken for the rotisserie. If you do not truss the chicken then two things happen. The legs and arms hang off of the chicken and as they get cooked they fall even further away from the body. They then get too close to the heat and burn before the body is cooked. Also since they hang off of the body they cause the rotation to be slow then fast as they are raised and lowered which also causes uneven cooking. 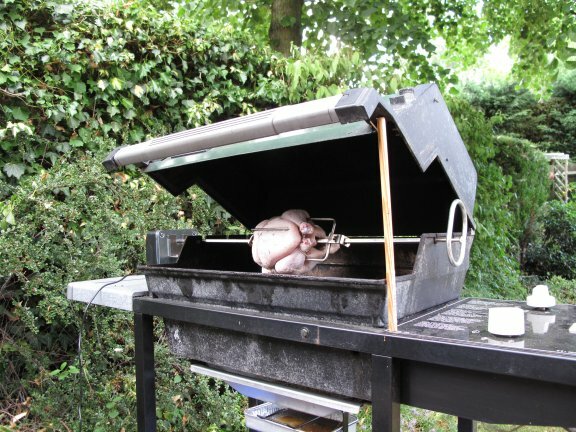 Jamie Purviance says to cook the chicken on the rotisserie in the BBQ with the lid closed over medium heat. The Modernist Cuisine says that is not roasting but instead baking. Spit-roasting also called rotisserie of a chicken is an essential feature of the cooking. The food goes from hot when the food faces the fire or heat, and slowly rotates away from the heat into the cool which is the secret to a great roast. I have been wanting to try open lid cooking since I read that section, so here is the start of the process at 5:30 ( I wanted to eat at 7:00). I just put the front burner on medium to get the hot cold thing going. After about 45 minutes it was supposed to be half done, not even close. I cut the stick in half. After another 45 minutes it was supposed to be done, nope. I cut another 2 inches off the stick and turned on the back burner too. Now I was really hungry and it still was about an hour away. Cranked up both burners to high and started to get sound of fat hitting the flavour bars, now we are cooking with gas. Another hour and it was finally done. Waiting the 15 minutes for it to rest was agony, the smell was great and it looked so good. I took a pair of scissors and cut in half. I grabbed some paper towels and sat down and trough’d the lot. It was great and so juicy I had to stop half way through and re-towel. Nothing left but bones, this made me go yuuuummmm! 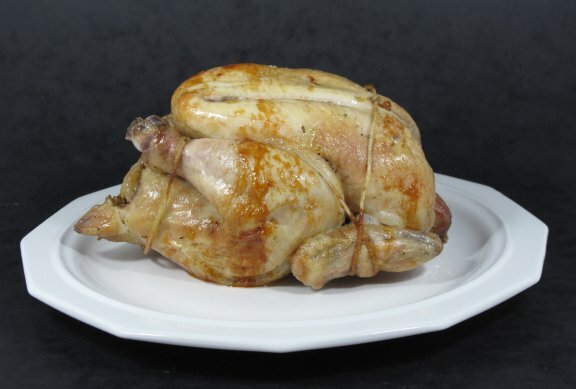 – When the chicken comes out of the brine it is very cold, allow an hour to come to room temperature, before BBQ. – The height that the BBQ lid should be open is about 8 inches not two feet. – Preheat the BBQ with both burners on high and then leave it that way. – Try putting some smoked paprika on the skin before roasting.